(Bloomberg) -- German auto supplier ZF Friedrichshafen, moving to acquire TRW Automotive Holdings, has been told by lenders that financing is available for a higher all-cash bid which could value the U.S. company at as much as $13 billion, people with knowledge of the matter said. ZF, working with Citigroup, is exploring a proposal that values TRW at between $110 to $112.50 a share, said two of the people, who asked not to be identified because the matter is private. Morgan Stanley and several European banks are also advising the company and financing the deal, the people said. ZF confirmed last week that it's in talks with TRW about an acquisition, which would create the world's second-largest auto-parts supplier by sales -- combining a maker of steering systems and transmissions with a leading producer of car-safety technology. The closely held company had initially valued TRW at about $11 billion to $12 billion, a person familiar with the talks said last week. Now that talks are public, TRW and ZF could reach an agreement in three to four weeks to prevent management disruption and allay concerns among automakers that dislike uncertainty with larger suppliers, the people said. ZF CEO Stefan Sommer is planning to brief employees about the logic of the bid on Friday, another person said. ZF's view is that a larger parts supplier, providing more auto components to a broader global base, can better withstand pricing pressure from automakers such as Fiat or General Motors, said people familiar with the matter. Colleen Hanley, a TRW spokeswoman, declined to comment as did Martin Demel at ZF. Other banks joined ZF's effort this past weekend after TRW indicated support for a higher proposal, the people said. ZF can easily borrow as much as four times its and TRW's combined earnings before interest, taxes, depreciation and amortization, two people said. ZF had EBITDA last year of about $2.3 billion, while TRW reported 2013 EBITDA of $1.72 billion, implying that the German company can borrow as much as $16 billion. A Citigroup spokesman declined to comment, as did representatives for Morgan Stanley and Goldman Sachs Group Inc., which is advising TRW. TRW shares closed Thursday at $102.62 in New York trading, giving the company a market value of about $11.4 billion. ZF is looking to add TRW technology -- from airbags to collision sensors -- that keeps drivers secure and help them avoid crashes, to its existing suite of mechanical parts, as consumer demand and government regulation are spreading the adoption of features to prevent accidents and protect passengers and pedestrians. TRW, which derived most of its sales last year from safety-related products, said in April it projects the market for driver-assistance technology will grow more than fivefold through 2020. A combination would create a company with almost $40 billion in annual sales, vaulting ZF to the No 2. spot among world's largest auto-parts suppliers, rankings compiled by Automotive News show. 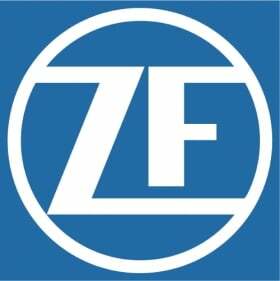 ZF currently ranks ninth among auto-parts suppliers, with TRW at No. 11, the Automotive News rankings show, based on last year's sales. Combined, they could surpass Japan's Denso Corp., which had about $35.8 billion in auto-parts sales in 2013, and rank behind Germany's Robert Bosch GmbH. Based in Friedrichshafen, Germany, ZF makes steering systems, clutches and axles, and transmissions, including the fuel-efficient, nine-speeds Fiat uses in its Jeep Cherokee SUVs and Chrysler 200 sedans. Its primary shareholder is the Zeppelin Foundation, started by airship pioneer Ferdinand von Zeppelin in 1908.